Learn how to use Marvelous Designer and Character Creator (CC) to create Marvelous Designer clothing for iClone by their technical trainer, Chuck Chen. Reallusion recently saw great advantage of combining MD’s superior design environment with CC’s powerful clothing system to create an animated clothing for their iClone users and iAvatars. This free video tutorial series is for users of iClone 6 and teaches how to make a flamenco inspired dress in Marvelous Designer and the process of turning it into clothing that can be used for iClone and CC. In Part 1 of the iClone Tutorial on Cloth Design with Marvelous Designer, you learn how to make a flamenco-style dress in Marvelous Designer software program. In Part 2 of the iClone tutorial series you learn the workflow of bringing in the dress from Marvelous Designer to ZBrush and MAYA, including how to make maps and using Photoshop (PS). You’ll learn how to export a Marvelous Designer dress to ZBrush for additional high poly detailing. Next, we’ll retopologize the dress to make a low-poly mesh in Maya. Then we bake from the High Poly and the Low Poly a few projection maps in XNormal. We’ll adjust these projection maps inside Photoshop to create all texture maps. 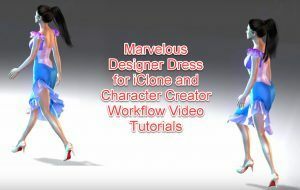 In this last and final part, part 3 of the Marvelous Designer to iClone tutorials, you learn about Rigging a Marvelous Designer Dress inside Character Creator and setup inside CC and iClone and add motion to animate the iClone character with the Marvelous Designer dress. We hope you enjoyed this tutorial of the Marvelous Designer to iClone workflow for iClone6 users. Please leave your comments below and if you have other workflows you wish to share – feel free to do so and help other 3D and CG artists! iClone is a real-time 3D animation software with digital actors, quick animation tools and powerful camera and lighting systems. It’s designed not only for storytellers and filmmakers, but for any creative artist who seeks visual communication. “Show and tell” is a common expression to exchange ideas effectively and make your messages believable. iClone contains comprehensive toolsets that can turn your abstract concepts into practical ones, allowing you to visualize your story without any prior 3D experience. iClone 3D animation software is far superior to DAZ3D and even Poser, though more expensive. It boasts a quick 360-Video output. Creating a 360 panorama video in iClone is quick and easy, allowing you to immerse yourself in a Virtual Reality world where you can share and explore. The iClone software also has an Alembic export capability, which is an interchange point cache format used by visual effects and animation professionals, that allows you to bring sophisticated iClone animation detail to other game engines, or 3D tools. iClone also has an upgraded MixMove Generation II engine, the industry’s only automatic motion blending technology that allows you to intuitively click-and-direct character animation and generate smooth motion sequences. iClone is more than simple an animation production tool, as it incorporates leading technologies such as Nvidia’s PhysX, SpeedTree and Allegorithmic’s Substance Painter to produce stunning visual quality, in addition to superb render quality with Indigo RT. Additional amazing goodies are coming soon! iClone is made by Reallusion, a Korean based company with strong emphasis on quality, innovation and great customer support. They offer a bunch of awesome add-ons like Kinect MoCap plugin, iClone Perception Neuron Motion Capture, and Character Creator, to name a few. Character Creator (CC) is an amazing FREE add-on tool for iClone 6 that enables you to create realistic looking, animation-ready 3D human characters for use with iClone and other 3D tools. Unique character designs are created through the use of shape morphs, customizable high-resolution skin textures, and outfits with clothing containing your own fabric designs. iClone / CC bridge to DAZ studio is an issue at present. So new alliances will hopefully soon be forged, to enable easy dynamic 3D clothes creation for iClone/ CC. Integration with Marvelous Designer will greatly enhance the software. Watch here Marvelous Designer to iClone workflow video tutorial series on how to create your 3D clothes in Marvelous Designer for use in iClone and CharacterCreator. Thanks a lot, for all shared information. Thank you, Victor! Glad you are enjoying our training and other products and thank you for being our customer!